Gearing up for the upcoming pujas and functions, new bride? Here's some major outfit inspo for all those events! Just when you are getting over the shock of your wedding taking place successfully, you are slapped in the face with zillions of pujas and rituals that the ‘nayi bahu’ has to follow. You may be newly married but lets face it, you can’t wear a heavy lehenga and 902181 kgs of gold for every post wedding function! You must have cracked your brains for the wedding outfits and must be exhausted by now. Fikar naat, bahurani! 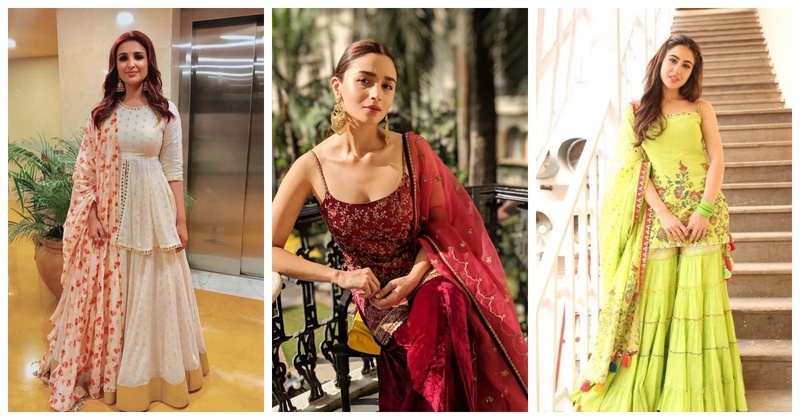 I’ve got some major outfit inspo for all those pujas and functions you have to attend as the nayi bahu! 1. Deep plum sharara pants with noodle sleeves top. Yaas! 2. Loving the ivory peplum with palazzo with colorful dupatta! 3. TV Sweetheart Erica Fernandes’ light ruffle saree with jazzy blouse is the perfect combination! 4. Pink never ditches, honey! And pink banarasi silk is sone pe suhaga! 6. Tissue sarees with heavy zari border make quite a statement! 7. I don’t need to say anything about this outfit- sharara pants with a short mirror work kurti = WOW! 8. Red brocade gown is perfect for every occasion! 10. Yellow anarkali all the way! Heaving a sigh of relief, aren’t you?